I have in this section collected population statistics from all European countries. Because systematic and regular censuses were not carried out in Europe until the end of the 18th century and the beginning of the 19th century are all figures before that just estimates based on a very limited material. The further back in time you get, these figures become more and more just guesswork. The estimates of some countries populations can therefore also vary from book to book. 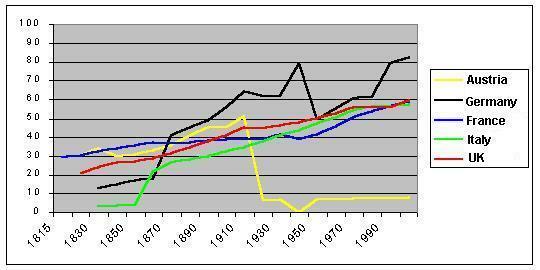 I have collected the statistics in this section without scrutiny from several different sources, although most of it comes from the work International Historical Statistics 1750-1993. These statistics should therefore because of the large number of different sources be used with caution and at your own risk. Be also aware that the borders of most countries has changed several times and that the population statistics can therefore refer to either the country within its present or its historical borders. The figures for Germany in the diagram above refer to Prussia before the unification 1871 and West Germany during the Cold War. In a similar way does the figures for Italy before the unification 1861 refer to the kingdom of Sardinia. The Austrian figures before 1918 refer to the entire dual monarchy of Austria-Hungary.